This is Andre Rieu's new DVD for 2015 and his best yet. It's Andre Rieu's 2015 Maastricht concert on DVD. Grab this while you can. Andre Rieu Wonderful World DVD. André's fans have been looking forward to this moment for nearly a year: the new DVD of this summer’s Vrijthof concert in Maastricht is out! It was a fantastic event once again, with tens of thousands of people coming from all over the world to enjoy it. If you missed it, now is your chance to catch up. 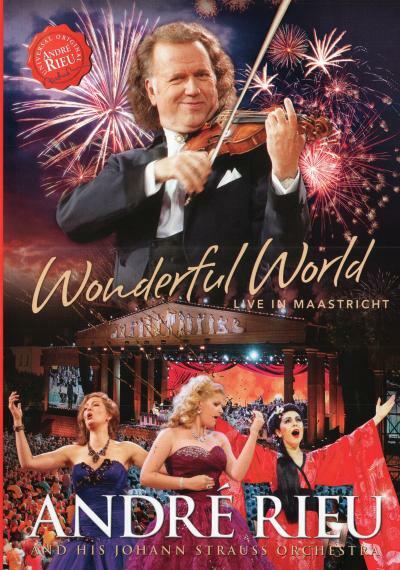 As always with André, ‘Wonderful World DVD’ is a brilliant product, bringing you a fabulous summer evening concert in Maastricht. The Platinum Tenors sing a world-famous aria from Georges Bizet’s ‘The Pearl Fishers’ and the well-known ‘Amor, vida de mi vida’. Carmen Monarcha shines as Madam Butterfly, Donij Van Doorn sings the Vilja song with great passion and Mirusia Louwerse steals everyone’s heart with a song from ‘The Phantom of the Opera’. Under the inspirational direction of André Rieu, the Johann Strauss Orchestra plays pieces including ‘Capriccio Italien’, ‘The Gypsy Princess’ and ‘The Blue Danube’. Once again this year André invited some very special guests for the Vrijthof concert: the pan flute musician Gheorghe Zamfir and a range of Romanian musicians and dancers, who provided the stunning finale to a fabulous concert. 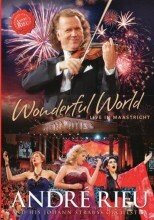 This is Andre Rieu's Wonderful World DVD. Click the button below to add the ANDRE RIEU - WONDERFUL WORLD to your wish list.